Samford University students and faculty rolled up their sleeves and went to work for the community during annual Samford Gives Back Day Saturday, April 13. More than 400 took part in the university-wide service initiative. 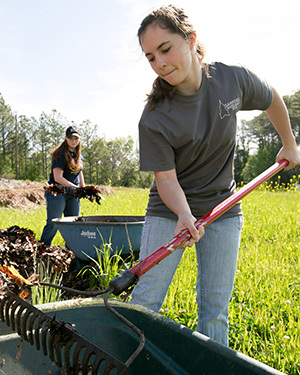 Students and faculty worked at more than 25 sites around Birmingham and Jefferson County including such locations as Habitat for Humanity, Northstar Ministries, Lovelady Center, East Lake Methodist Church, Urban Ministries, Ruffner Mountain, TEMPO at Railroad Park, Homewood Community Gardens (where students Alex Gerrish, foreground, and Paige Van De Vuurst load mulch, at right) and others. Students Andy Winchester and Ben McGlamery were part of a group working on a Habitat for Humanity homebuilding project in Hueytown. "I love the mission here, supporting people, and working together to get these people in their new house," said Winchester. "It makes you feel really good, just waking up this morning and knowing you can come out and make a difference," added McGlamery. The annual work day was organized by Samford's Office of Student Leadership and Community Engagement and Omicron Delta Kappa national service fraternity. Director of Student Leadership and Community Engagement Janna Pennington said one goal of the program was to provide exposure for students to learn about the community and ways they can serve beyond Saturday. "Programs like Samford Gives Back give students the opportunity to experience life outside of the Samford gates and see how they can plug into the Birmingham community," Pennington said. Senior sociology major Taylor Bell worked with Pennington to coordinate the day of service. He led a devotional at the start of the day in Pete Hanna Center, urging the volunteers to "take time to get to know your host and (to) learn why their work is important."